Earlier this week, TNW dropped by the shared office space in Beijing, China that Microsoft Accelerator for Windows Azure (MAWA) has set up for the 10 companies that are part of Microsoft’s strategy to build up goodwill with the startup community. 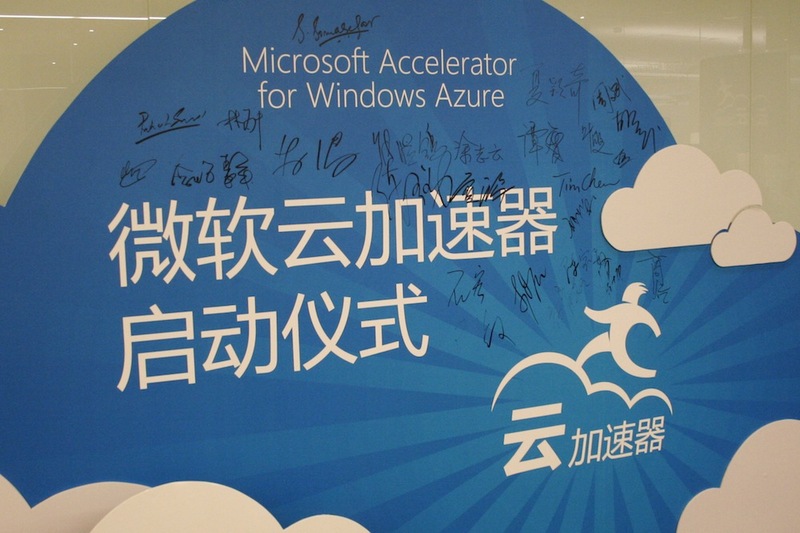 The 6-month Microsoft Accelerator for Windows Azure program, dubbed MAWA, got off to a running start in Beijing in July, following in the steps of the first class, which launched in Israel. Since then, the company has also launched in Bangalore. When I asked Microsoft Accelerator director David Lin what the end game is with the accelerator, Lin candidly admitted that the company is hoping it will help Microsoft “be cool again.” Partly in response to learning that its Windows Azure cloud platform was not even being considered by some startups in Silicon Valley and elsewhere, Microsoft built the program to “earn the right to have a voice” in the community. Azure is one of the pillars of Microsoft’s long-term strategy, which Lin describes as “hardware + software + cloud,” a variation on Microsoft CEO Steve Ballmer’s “devices plus services” mantra. The only requirement for MAWA participants is that they make use of Windows Azure. Microsoft doesn’t provide funding, but it does offer $60,000 in cloud-service credit, as well as mentorship and office space. Lin believes the Azure credit will give the companies a leg up on other local startups. I asked Lin whether preference was given to companies building products and services on other Microsoft platforms like Windows Phone and Windows 8, but, he said the accelerator embraced companies working on a variety of operating systems. “We don’t care what these companies do on their front-end. We’re agnostic on the client side,” he assured. Venture capital firm IDG worked with Microsoft to find this first batch of startups in Beijing. Most of the participants came by way of recommendation and referrals. Candidates were narrowed after assessing the teams and their intellectual property, technology and business models. A design-centric developer of Windows Phone applications, such as LomoCam, Lock Screen and Moment. Lin says Snack Studio’s CEO has been providing design help to the other accelerator companies, as some of them have yet to hire designers. Aiming to solve the problem of testing across multiple devices, Testin builds testing racks containing hundreds of Android devices to quickly check app compatibility. It also offers testing for iOS devices and has plans to support Windows Phone device testing as well. The company is one of the most far along startups among the group, as it has already brought in tens of millions of dollars in funding. This company is building solutions for sorting, sharing and viewing photos in the cloud. It’s also interested in other photo-related application features like album management, special effects and animation. Unidust is working on a Chinese-language “Siri”-style voice assistant called Voice Wormhole Assistant. I’m told the product already has some impressive natural language skills and can carry on a conversation. By clipping webpages into short summaries, EachCloud aims to help users with content consumption. The company also adds a social aspect to reading by linking up users with similar webclips. Fulcrum has built an OpenXLive mobile gaming social network similar to OpenFeint. It’s currently the biggest gaming platform on Windows Phone 7. This startup is in the “edutainment” business and is focusing on the Japanese market. Its applications aim to leverage the mobile Internet to game-ify life. Also known as FeiYan, Future Pay has developed a service that sends custom meals to by way of MMS. Atom is currently still in stealth mode, but we’re told it’s building “social collaboration tools” for mid- to small-sized enterprises.